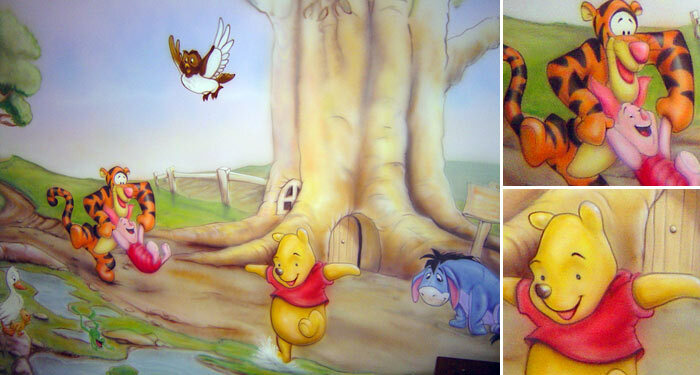 This mural was created on a young child's bedroom wall, which re-created the fun and colourful characters of "Winnie The Pooh" using Garry's specialist airbrush skills. As you can see from the above image, the detail of the artwork is absolutely fantastic and really makes these gorgeous characters come to life. The overall size of the wall was 3 metres wide by 2 metres tall. The total time from conception to completion to create this spectacular bedroom mural was approximately 5 working days. This time included creating the artwork, preparing the surface and airbrushing the artwork on to the wall. To have a similar artwork created for your child's room, you may expect the price to range from $1000 - $2000. If you would like to get a free quotation on any ideas that you may have, please contact us.